Hearts of Palm Galette is made with hearts of palm, marinated artichoke hearts, more savory veggies & smoky bacon. 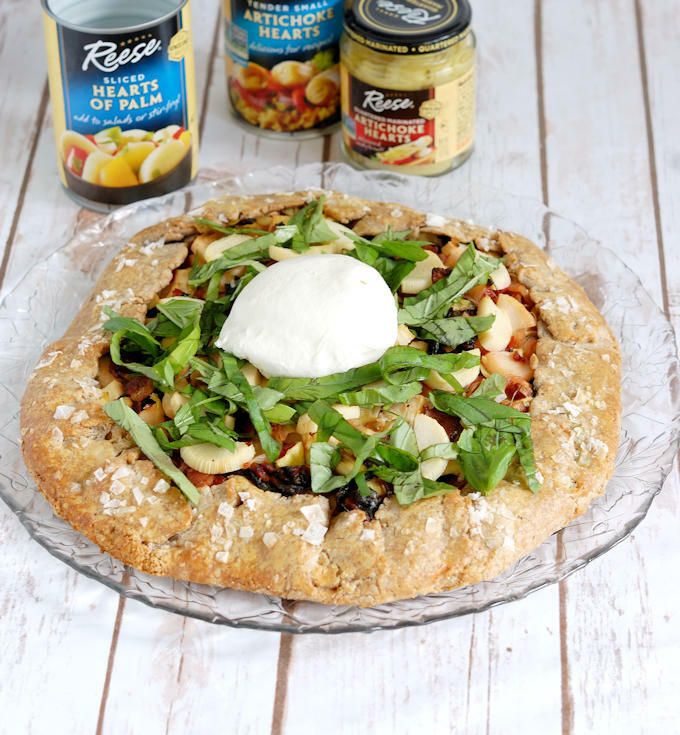 The Galette is formed with a rustic, whole grain rye crust. 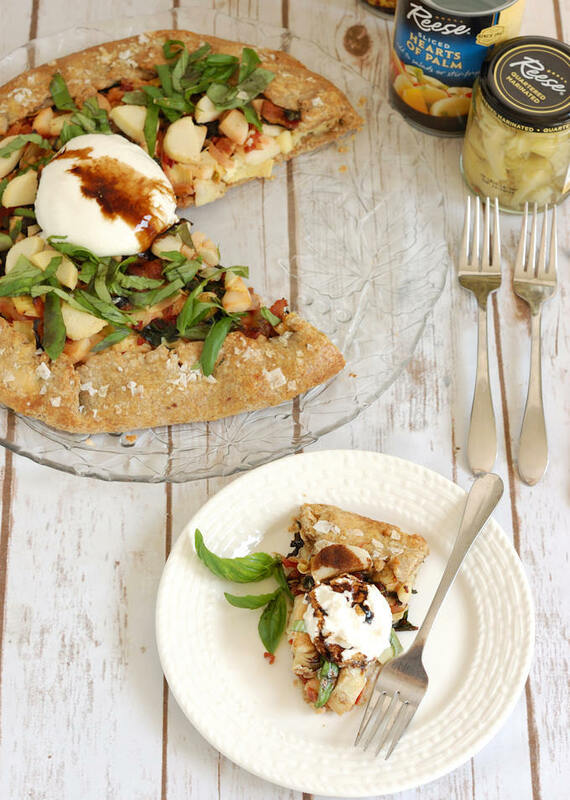 Top it with fresh basil, Buratta cheese & balsamic glaze for a perfect lunch or light dinner. Disclosure: I was financially compensated to create the recipe for this post and I received product samples. 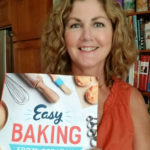 The opinions and recipes are completely my own based on my experience. 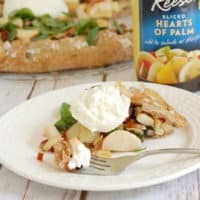 I’m so excited to be working with Reese Specialty Products for this Hearts of Palm Galette recipe. Before receiving a box of goodies from Reese, I’d never tasted hearts of palm before. I’m not sure how this happened since I obsessively seek out new ingredients. Well, now I’m a fan. 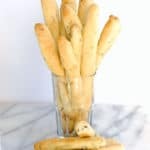 I love the crisp-crunchy bite and slightly salty flavor of hearts of palm. I’m a huge fan of artichokes in any form, especially artichoke hearts, so I knew these two ingredients would come together and create a great flavor profile. I could imagine throwing sliced hearts of palm into salads for added crunch, or using them as a topping on tacos or folding them into everyone’s favorite baked artichoke dip. I love to add crunchy ingredients to tuna and egg salad. I’ll definitely be adding chopped hearts of palm to my next batch of tuna salad. But, since this is a baking blog, I was eager to try hearts of palm in a baked recipe. 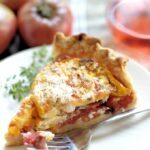 One of my favorite ways to bake with savory ingredients is to put them into a tart shell or wrap them in a galette. As I’ve said many times, give me any form of fruit wrapped in a crisp crust and I’m a happy camper. Well, I’ll expand that sentiment to include veggies wrapped in a crisp crust. Once you gather the ingredients, Hearts of Palm galette comes together quickly. Because they’re free-form tarts that don’t need a special pan, galettes are super easy to make. 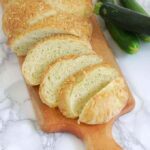 They’re supposed to be rustic so you don’t need to worry about a perfectly crimped crust. 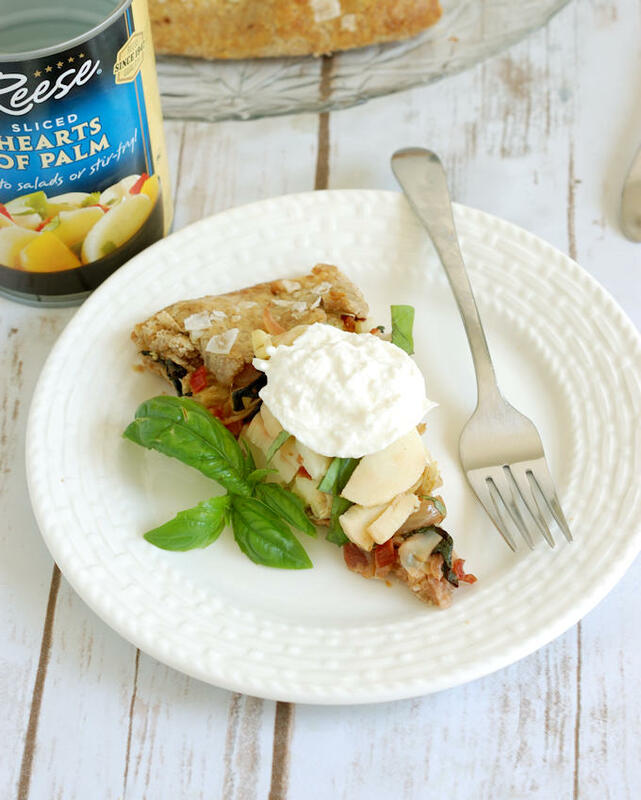 Hearts of palm and artichoke hearts give the filling for this galette a chunky, crunchy texture. I think we sometimes forget how important texture is in our food. As a bonus, hearts of palm are super healthy because they’re low cholesterol and full of potassium and vitamin C. I amped up the nutrition of this recipe with a whole grain rye crust & leafy greens. So, ok, there’s a little bacon in there, but, hey, everything’s better with a little bacon. Am I right? 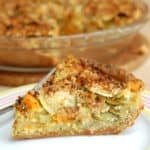 If you want to make a vegetarian version of this recipe you can leave out the bacon and make the crust with vegetable shortening. 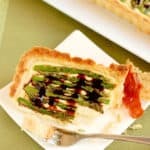 For a vegan version, you can also eliminate the Buratta and serve the Galette with a vegan-friendly topping. 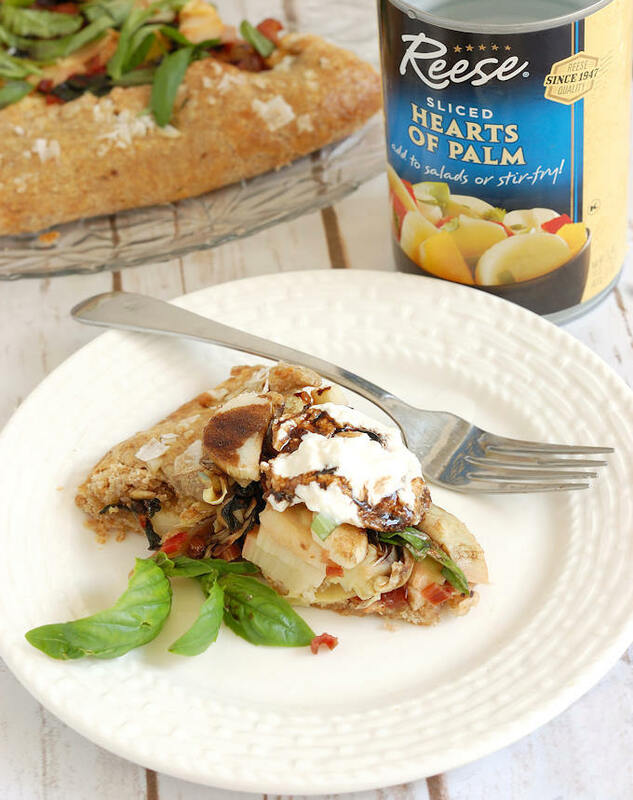 Watch the recipe video to see how to put together a delicious & nutritious Hearts of Palm Galette. A hearty and savory galette featuring hearts of palm, artichoke hearts, rye crust and buratta cheese. 1/4 cup (2 oz, 55g) butter, very cold, cut into 1/2" slices. 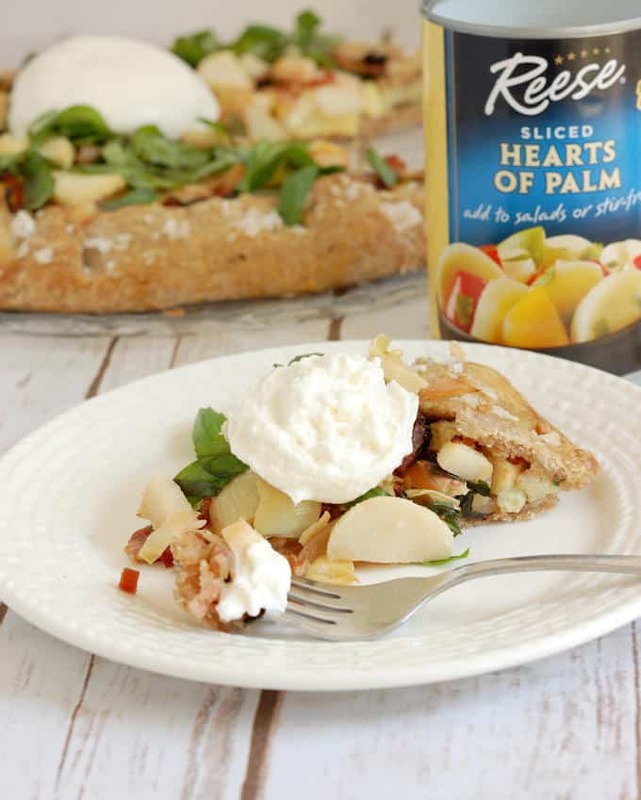 14 oz can Reese Hearts of Palm, drained and chopped into 1/2" pieces, reserve a few slices for the top of the galette. Combine the flours with the salt, pepper and sugar. Whisk together to mix the ingredients. Using your fingers, cut the lard/shortening into the flour mixture until just a few lumps remain. Using your fingers, toss the butter into the flour mixture. Squeeze the butter slices into "flakes" and allow them to break up into slightly smaller pieces. Work quickly so the butter doesn't get warm. Don't break the butter down completely. There should be some large flakes remaining. Mix the water and the cider vinegar. Pour the water onto the flour all at once and toss to combine. Gently press the dough just until it comes together. It may look a little dry in spots. The water will redistribute in the dough as it rests. Form the dough into a disc. Wrap the dough and refrigerate for at least 2-3 hours before using. Fry the bacon until crisp. Remove the bacon and set aside. Add the onions, garlic and salt to the bacon fat in the pan. Saute over medium-low heat until the onions are softened and beginning to brown. While the onions cook, strip the leaves from the chard and cut into small ribbons.Trim the ends from the chard stems and chop into small dice. Add the chard stems to the onions and cooks until the stems are softened. Add the black pepper and red pepper flakes to the pan. Add the chard leaves and saute until softened. Remove the pan from the heat. 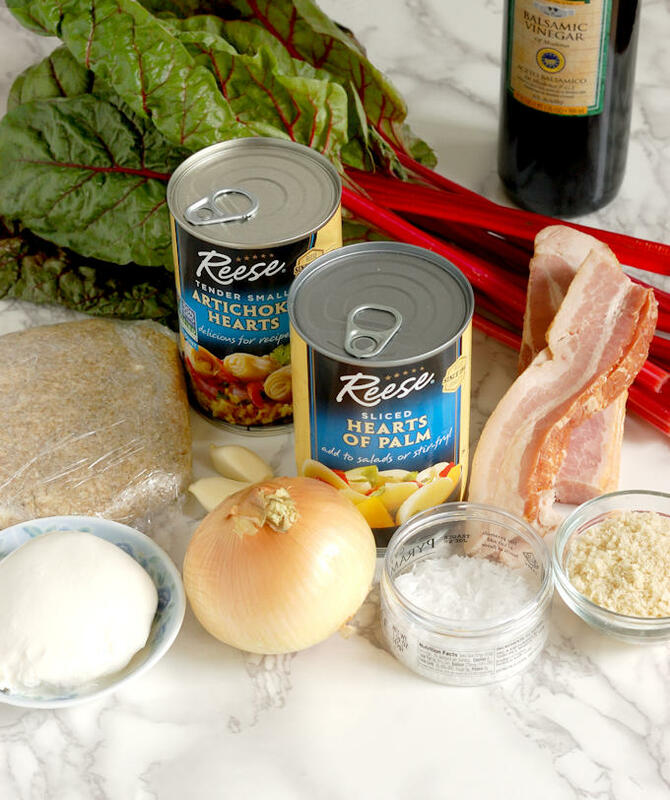 Crumble the bacon and add to the pan. Stir in the hearts of palm and artichoke hearts. Adjust seasoning to your taste. Cool to room temperature. Preheat the oven to 375°F convection or 400°F regular. Sprinkle the panko bread crumbs onto the dough, leaving a 1.5" border all around. Spread the cooled filling over the bread crumbs. Fold the border over the filling, pleating the dough into an attractive pattern. Arrange the reserved Hearts of Palm slices over the filling. Brush the border with egg wash and sprinkle with finishing salt. Bake until the crust is golden brown and the filling is hot, about 15-20 minutes. While the tart is baking, simmer the balsamic vinegar in a non-stick pan until it's reduced to a thick syrup. Sprinkle the basil leaves over the tart as soon as it comes out of the oven. Drizzle the glaze over the tart. 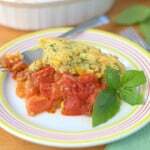 Serve slightly warm with the buratta on top. 1. Because of the stone ground rye flour this dough is tender and may crack a bit as you roll. 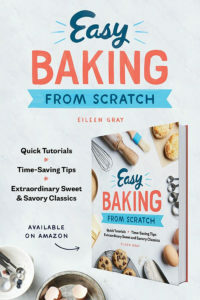 Roll gently and use your fingers to close any cracks that form. This is a rustic tart so don't worry if it doesn't look perfect.